Edgar and Shamus Award finalist Ben Rehder's Blanco County comic mysteries have made best-of-the-year lists in Publishers Weekly, Library Journal, Kirkus Reviews, and Field & Stream. 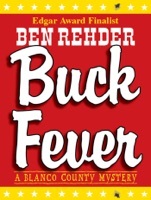 Buck Fever was nominated for the prestigious Edgar Award for Best First Novel. Description: It's the week before deer hunting season, as close to a statewide holiday as you get in Texas, and the locals are getting restless. Game Warden John Marlin has his hands full with poaching complaints coming in faster than he can write out-of-season tickets. Then a call of a different sort comes in. A man dressed up in some sort of deer costume has been shot at the Circle S ranch, and witnesses are reporting a massive wild-eyed buck prancing about the pasture in a lovesick frenzy. Marlin's seen a lot in his years, but this is wilder than he could have imagined: the man in the deer suit is a good friend, and the whacked-out whitetail isn't exactly a stranger either. It's the beginning of a mad, frantic weekend in Blanco County, one that will see a few more men shot, an invasion by Colombians with more than hunting on their minds, and damn near the end of Marlin's life. Ben Rehder serves it all up with a huge helping of humor in this debut comic mystery that will firmly establish him as the funniest crime writer in Texas. "This debut novel is a complete success, tearing out of Texas chock-full of characters so nutty and events so strange it seems as if they must be real. The writing here is confident and vigorous; the tone is quintessentially Texan and relentlessly wry. There's sure to be a long career for this happy, wacky series." "This is a wild and crazy first novel, crowded with weird people, unusual relationships (both animal and human), and frequent humor that will appeal to fans of Carl Hiaasen, Tim Dorsey, and other comic mystery writers. Strongly recommended for most collections." "It's been our pleasure to be among the first reviewers to take notice of several writers who eventually became best sellers, including Nevada Barr, Lee Child and Randy Wayne White. Ben Rehder has what it takes to join that group. Imagine Carl Hiaasen with a Texas accent…"
"Briskly paced, amusing, spiced with deftly drawn good-old-boy portraits: an altogether promising debut." "…side-splitting…akin to the Tom Robbins style of humor writing." "Austinite Ben Rehder's debut novel is the summer's best find. With a nod and a wink to Carl Hiaasen, Rehder comes out swinging with a sardonic Tex-centric look at trophy deer hunters, beer-guzzling poachers, and Game Warden John Marlin—the man charged with keeping them all in line. Buck Fever is too fun to be legal." Finally I get this ebook, thanks for all these Buck Fever I can get now! Buck Fever was the best books I ever buy. Buck Fever did exactly what you said it does. I will recommend you to my colleagues. Buck Fever is the most valuable books we have EVER purchased. I'd be lost without this. I am completely blown away.